Unibrain provides the Firewire users with the best Glass Optical Fiber (GOF) Repeater that extends the S800 (800Mbps) transmission of 1394b bus up to 550 meters distance over fiber optic cable. The GOF Repeater is equipped with the NEW TSB81BA3D, the latest revision of Texas Instruments’ 1394b PHY, providing fully reliable 1394b speed and configuration. Each GOF Repeater800™ unit has two (2) 1394b bilingual copper ports and one optical port LC type. Multi-Mode-Fiber (MMF) Glass optical fiber cable support. Maximum link length 550 meters. Operates in 1394a or 1394b connections with both PC or Macintosh. Incorporates the NEW, TSB81BA3D, the latest revision of Texas Instruments’ 1394b PHY, providing fully reliable 1394b speed and configuration. LC duplex Connector optical interface. 850 nm Vertical cavity surface emitting laser. Operation: -0 oCto +70 oC / 20 to 80 % rel. non cond. Storage: -10 oC to +60 oC / 20 to 95 % rel. non cond. +12V / 3A. 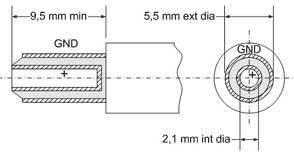 The jack plug of the DC adapter has the following dimensions and polarity as on the next figure. GOF Repeater™ has successfully passed the EN 55022 (Emissions Environment) and EN 55024 (Immunity Environment) EMI test procedures. Subsequently, this product is fully CE compliant and assigned with the CE mark. Moreover the board is FCC compliant. Connect one (1) PC or Macintosh, having 1394a or 1394b interface, to an GOF Repeater800™ via one 9-6 or 9-9 cable. Connect the two GOF Repeater800™ via Glass Optical Fiber Cable (up to 550 meters). Connect the second repeater via one 9-6 or 9-9 cable to the other PC or Macintosh. Connect one (1) PC or Macintosh, having 1394a or 1394b interface, to an GOF Repeater800™ via one 9-6 or 9-9 cable. Connect the two GOFRepeater800™ via Glass Optical Fiber Cable (up to 550 meters). Connect the second repeater via 9-6 or 9-9 cables to 1394a or 1394b cameras. NOTE: In this case it is mandatory the usage of the 12V power supply in order to provide current to the repeater that is connected to the cameras. Connect one (1) PC or Macintosh, having 1394a or 1394b interface, to an GOF Repeater800™ via one 9-6 or 9-9 cable. Connect the two GOF Repeater800™ via Glass Optical Fiber Cable (up to 550 meters). Connect the second repeater via 9-6 or 9-9 cables to 1394a or 1394b external HDD. NOTE: In this case it is optional the usage of the 12V power supply in order to provide current to the repeater that is connected to the HDD, provided that the HDD receives external power. Connect one (1) PC or Macintosh, having 1394a or 1394b interface, to an GOF Repeater800™ via one 9-6 or 9-9 cable. Connect the two GOF Repeater800™ via Glass Optical Fiber Cable (up to 550 meters). Connect the second repeater via 9-6 or 9-9 cables to the DV camcorder. NOTE: In this case it is mandatory the usage of the 12V power supply in order to provide current to the repeater that is connected to the DV camcorder.